JOIN OUR 352,644 MEMBERS AND GET INSTANT FREE ACCESS TO DOZENS OF VIDEOS! There are two types of putters. Some seem to just float downstream, while others work really hard trying to swim upstream. We all have that one friend who seems to pick everything up very naturally. They move their body in ways that feel comfortable and effortless, and things just seem to happen for them. They make their putts. They go out and play an easy round without seeming to put any effort into their putting stroke at all. If you're not that person, there are probably times when you feel like you're working extremely hard on your putting, with frustrating results. You're trying to keep the putter face perfectly square, get the putter to swing straight back and straight through, really lock in your body, and get everything working perfectly, like a well-oiled machine. You're working really hard but you're not getting anywhere. You feel like you're swimming upstream. It's incredibly frustrating and we've all been there. What you really want is to make it effortless. If you get your body positioned correctly, you get the correct putting grip, and then just move your body the way it's designed to move, everything becomes extremely effortless. That's what we're going to do today. You're going to learn three incredibly simple moves so next time you can be the one floating downstream instead of flailing around and working hard to try and swim upstream. That's it. That's all there is to the putting stroke. These moves work with your body, so you're no longer trying to manipulate the club face in certain ways like "straight back and straight through," as you've probably heard or been taught before. First of all, you need to understand that the putting stroke works on an arc. You're not creating an arc. You're simply letting an arc happen because that's how it naturally works. Let's look at why that is. The first motion, as we saw above, is that the shoulders rotate around the spine. The spine is the axis of the swing. It's not going to move at all in the putting stroke. In order to keep the spine still, the lower body must do nothing at all. This is critical. It must not move an inch. Just forget about the lower body and keep it perfectly still. Your belt buckle should not move at all in the putting stroke. Stand up and try it right now. Rotate your shoulders around your spine without moving your lower body. Make sure your belt buckle stays completely still. This is how your arms and shoulders move in the putting stroke. The spine itself just rotates. The shoulders rotate around it and it never bends at all. That's how your body is made to swing. That's how your spine is made to rotate. It should be effortless and comfortable. Now hinge forward and rotate again. As you can see at left, rotating around your inclined spine creates an arc or a plane. Your spine tilts forward, but it still rotates without bending. As you rotate your shoulders around your spine you create an arc. That's where the arc comes from in the putting stroke. It's because your spine is tilted forward. What About Straight Back & Straight Through? At some point, you've probably been told to take the putter "straight back and straight through." If you tried to create this movement with your shoulders simply rotating around the spine the way they're designed to, you'd have to bend all the way over perpendicular to the ground. If "straight back & straight through" were anatomically correct: Don't try this at home! That would allow you to move the putter straight back and straight through, and still make an anatomically correct movement. Of course, you'd need a very, very short putter and your back would hurt if you tried to do it for more than 10 minutes! It's a lot easier just to go ahead and let your body set up and move the way it wants to, in a normal posture and with a normal length putter. Again, the shoulders rotate around the spine. When you hinge forward and make that rotating motion, you create a little bit of an arc or a plane. The club head moves a little bit to the inside as you bring it back, comes back to neutral through the impact position, and then moves a little bit to the inside as you swing it through. It's simply because your spine is tilted forward. You're only turning a very small amount. Even in a long putt, your shoulders won't rotate very much. That's all there is to the shoulder movement. It's very, very simple. The second piece is letting your arms flow freely from your shoulders, and it's just as simple as the shoulder rotation. Let go of your arms. Switch off all your shoulder and arm muscles and let your arms just dangle there naturally. You'll see that your arms also want to swing in a bit of an arc. Your right arm comes from the inside, bottoms out somewhere around your right foot (if you don't have the left hand on the club), and goes back to the inside again. That's how it swings naturally. The same is true of the left arm. It naturally comes from the inside, and swings back to the inside on a bit of an arc. That's really all the arms do. Once you have both hands on the club, it's OK to get a little bit of bend in the right arm as you let your arms swing back and the left arm as they swing through. We're talking a very small amount, of course, but a little bit of bend is not a problem. What About Rocking the Triangle? Permitting that tiny bit of bend allows the arms to flow freely from the shoulder sockets. You see a lot of people trying to lock everything together into a triangle when they putt, keeping both arms really straight so they can rock it all back and through as a unit. That looks fine from a physics standpoint. Mathematically, it may create a fairly decent arc, but it takes away all your feel and control. Pick up a ball and toss it to someone. You don't tense everything up when you do that; you stay very loose and just let it go. You don't have to think about the mechanics of tossing a ball. You aren't trying to lock everything in and get an exact angle. You just toss it, and for the most part it goes where you want it to. It doesn't end up way off to the right or across the room to the left. Most people can toss a ball without thinking about keeping everything perfectly straight. Then they go to putt and they want to lock in the arms, lock in the body and take away all that natural athleticism in order to get this perfect "straight back and straight through" stroke. They're making it much more difficult than it needs to be. If you let your body move properly, let it move the way it's designed, you can make a very natural, athletic movement and - here's the important part - the club face will square itself. You don't have to work hard and manipulate the club to square up the face. Just let it happen naturally. Quit trying to keep the face perfectly square going back and through, and let your muscles work the way they want to. That face will release at the exact same spot every time. Pick up the putter and let your arms swing freely again. Because it's traveling on a little bit of an arc, the putter face will start to open just slightly on the way back. Clay has exaggerated this slightly in the photo at right so you can see it. As your arm swings back the face will open slightly. Then it closes again as you come down. You're not creating this movement at all. You're just allowing it to happen as your arms swing naturally. The last piece, and probably the most confusing part for most people, is the movement of the club. It's a little counterintuitive and probably not quite what you've been taught before. The club does make a pendulum-like stroke, but it's a little different than what you may have heard when other people talk about the pendulum stroke. Imagine swinging back and through without providing any resistance on the club. If you just let your arm swing back, the club will trail right along with it. The weight of the club head might even cause your right wrist to bow forward a little. When you change direction, the club will lag behind, making your wrist bend back the other way. Of course the photos above are extremely exaggerated. Those are much larger movements than what actually happens in the putting stroke, but the motion is the same. What actually happens is that your arms slow down through impact to let the club release. If you're trying to accelerate through, you never let the putter release. If the club head is lagging behind and you try to drag your hands through, you prevent the putter face from releasing. Your hands stay forward and you deloft the club. What most people do, without even realizing it, is try to counteract that forward shaft lean by either getting extremely rigid with the arms, or adding a little bit of flip at the bottom. The club face is lagging behind like in the photo, so you try to catch up by flipping the wrist. What we want to do - and again this is going to be very exaggerated at first - is practice letting the club flow very freely from the wrist. As you swing back your wrist stays nice and straight. As you swing forward your wrist is so soft that it allows the club to lag behind. As your arms slow down, the club head can move through and release on its own. It sounds very complicated. It sounds like there's a lot going on, but it's actually an extremely simple motion. Try it yourself, using the right hand only and keeping it exaggerated at first. This is exactly what's happening in the putt. Your hands and arms actually slow down through impact to let that club head release. It feels completely natural. It feels like that's the way the club should swing. The only way you could change it is if you tried to apply force to manipulate it. Once you're comfortable with the drill you can go ahead and get both hands on the club. Now the movement will be extremely small, compared to what it was before. As you go back the putter stays very centered. It's almost like "rocking the triangle" at this point. As you start down you'll start to get a little bit of forward shaft lean, and then you let the putter release. In a real putt it's a very, very small movement. To the naked eye, it won't really look like you're letting the club lag behind and then release, but you are. You should feel that you're just letting the club release under its own weight, without manipulating it at all. This is what people mean when they talk about "releasing the putter head." It actually involves slowing the hands down a very, very small amount and letting the club's momentum carry it through. You relax your hands and arms, keeping them tension free so you can let the putter head release rather than trying to pull it through impact. If you pull the club through impact you'll never be able to release it and your putting will be extremely inconsistent. You'll have to practice a ton - you'll be swimming upstream. From down the line we can see in the final photo that Clay's shoulders are hinged forward, on a little bit of a different plane. The shoulders rock around the spine. The arms flow freely from the shoulder sockets, and the club flows freely from the wrists. If you pause in the backswing you will see that the putter face is slightly inside and slightly open. As you go back through, the putter head automatically closes and releases. You achieve all of this by keeping your arms and hands very relaxed and letting the club flow naturally, without any manipulation from your body. It should look like a pretty consistent, arcing stroke. That's why the putting stroke has a little bit of an arc. It's because of the way our bodies are put together. Everything works around an axis. We let the club flow freely, so we're not creating an arc; we're just allowing it to happen naturally. If you've putted "straight back and straight through" for a long time and it feels like a lot of work, that's because you've actually trained your body to do something that it's not naturally meant to do. You can become a good putter doing that, but it takes a whole lot of practice. Learn how to set up correctly, grip the club correctly, and let the club flow freely and you can be the most consistent, athletic putter you know, and make it look easy. Join our 352,644 members to watch this video and 350+ more! 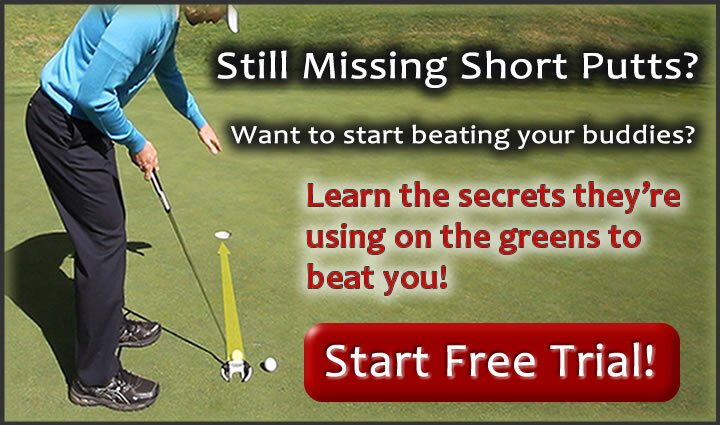 Get Your Free Membership to Watch "Perfect Putting Technique" Right Now! Join our 352,644 members to watch this video and 100+ more!